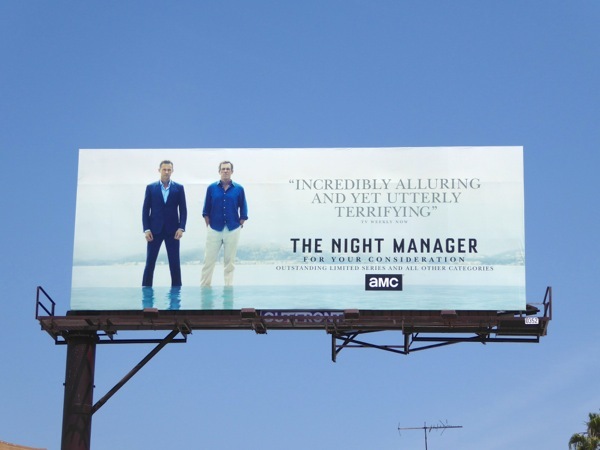 Not only is the collage gun design of this ad creative for The Night Manager visually interesting and relevant to the show's premise, but there's something spooky about Hugh Laurie's piercing eyes that seem to follow you when you pass by. 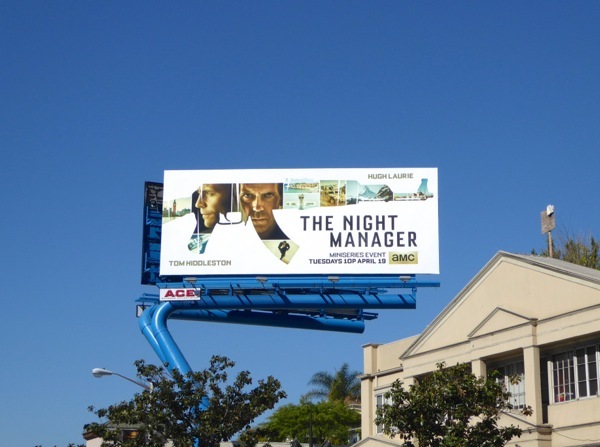 It goes without saying that these billboards for AMC's new mini-series stand out in the streets and skies of L.A. at the moment. 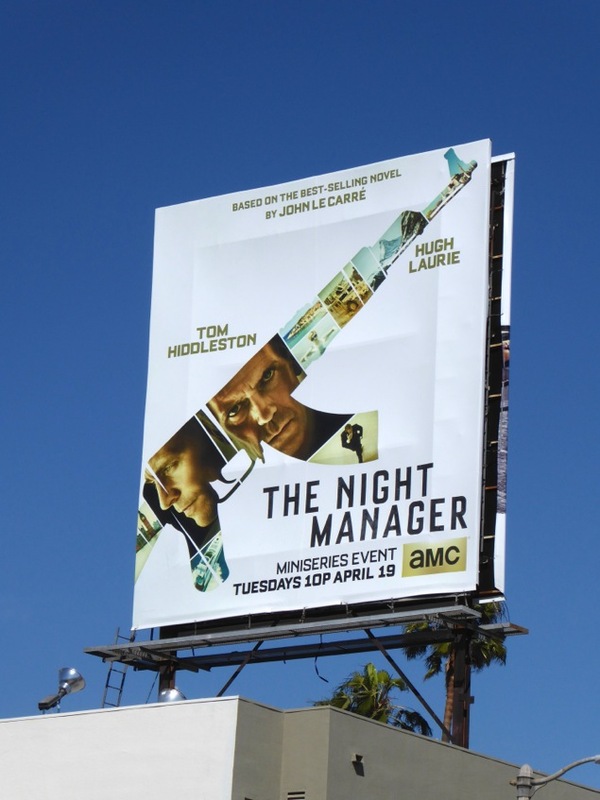 Based on John le Carré's 1993 novel, this thriller stars Tom Hiddleston as a former British soldier working the night shift at an Egyptian hotel who is recruited by intelligence agents to infiltrate the risky network of an international arms dealer, played by Hugh Laurie. 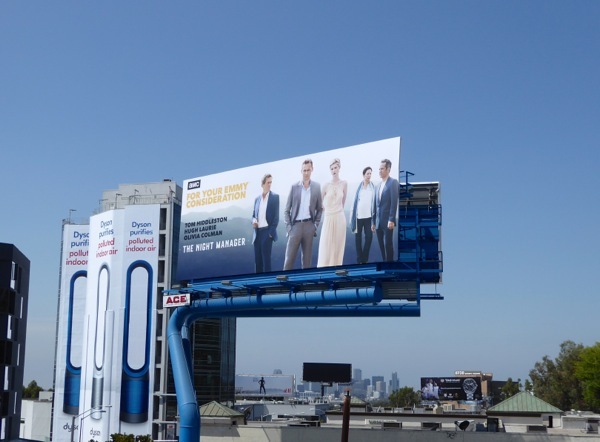 These eye-catching billboards were first snapped above the Sunset Strip on March 17, then along Beverly Boulevard and an additional ad location along West Hollywood's Sunset Boulevard through April 1, 2016. 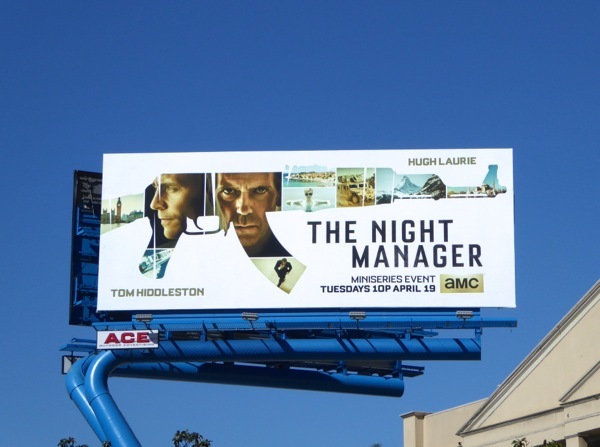 Fans of Tom Hiddleston can also check him out in these Crimson Peak movie billboards and this giant Thor: The Dark World film billboard. 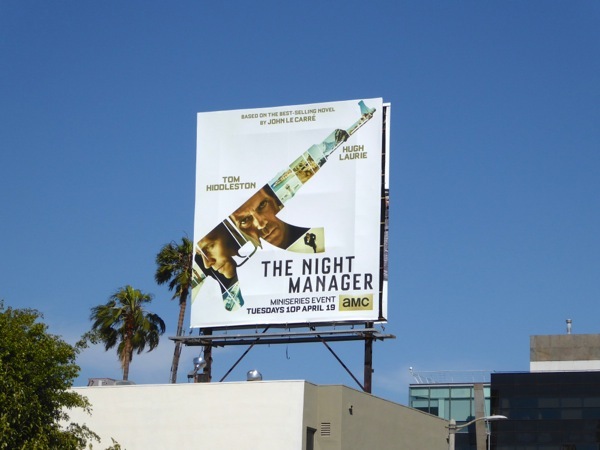 A dangerous espionage mission, an evil crime lord and seductive love triangles, it's almost as if someone is auditioning to be the next James Bond. 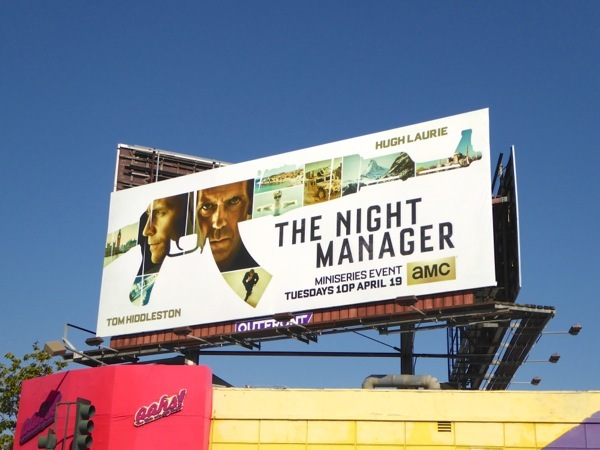 Now will you be giving this six episode AMC mini-series a shot? 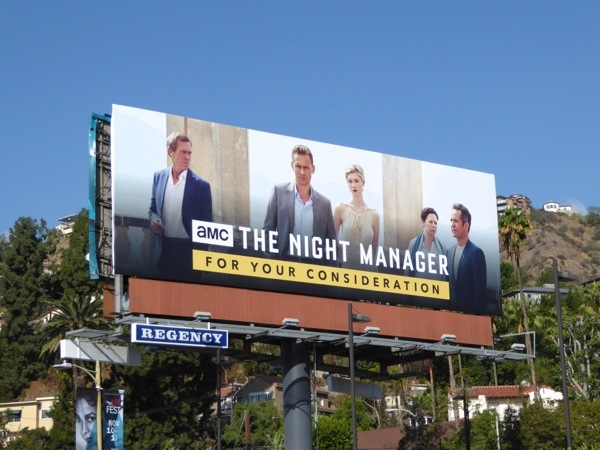 UPDATED: The Night Manager received rave reviews, but will the TV Academy also recognise the mini-series with some Emmy awards this year? 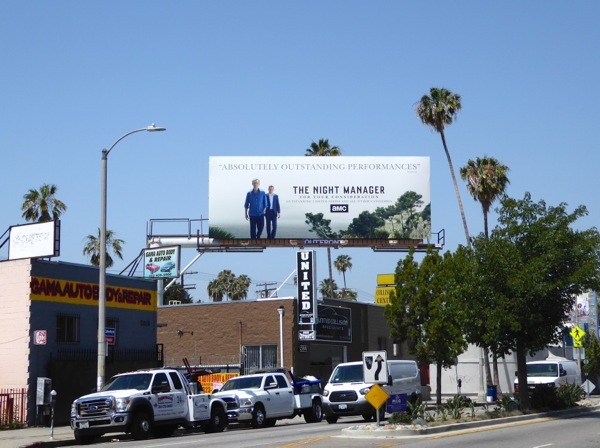 Here's some examples of The Night Manager's Emmy consideration campaign filling the skies of L.A. along Pico Boulevard and La Cienega Boulevard on June 2, 2016. 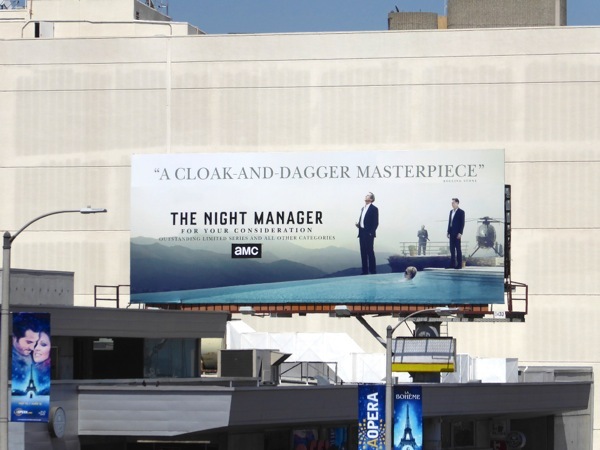 You really can't help but notice these striking billboards for the "cloak-and-dagger masterpiece". 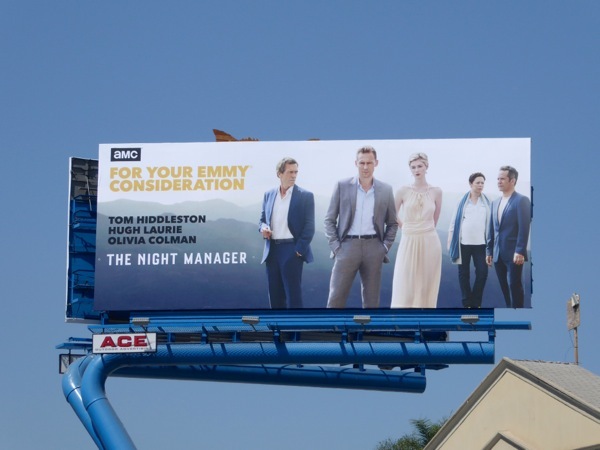 UPDATED: The Night Manager scored seven Emmy nominations, including nods for Outstanding Limited Series and in the acting categories for Tom Hiddleston, Hugh Laurie and Olivia Colman. 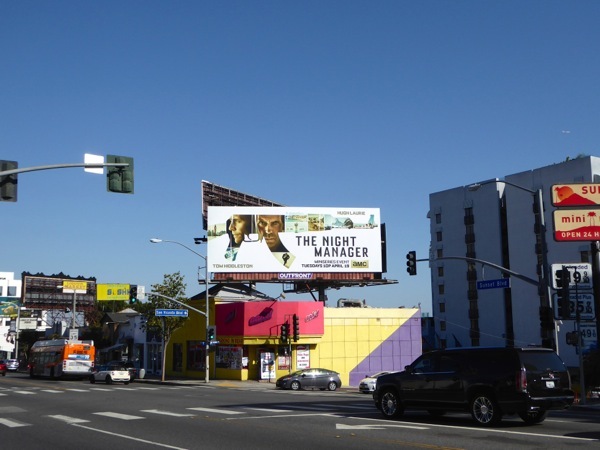 This new Emmy consideration billboard for the AMC series was snapped above West Hollywood's Sunset Strip on August 3, 2016. 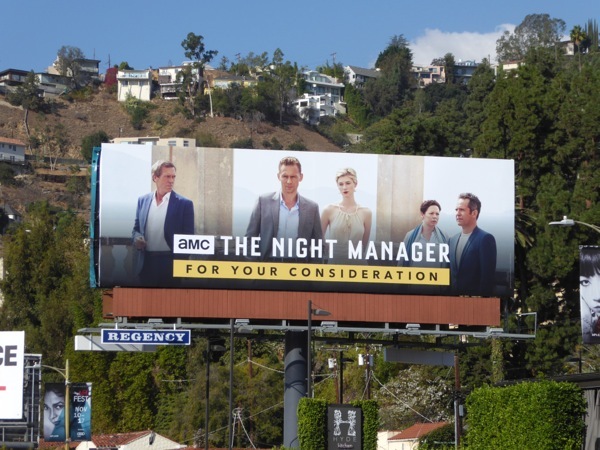 UPDATED: The Night Manager may have won two Emmys for Outstanding Directing and Music Composition, but there's still time to win a Golden Globe, SAG Award or another industry accolade for the mini-series. 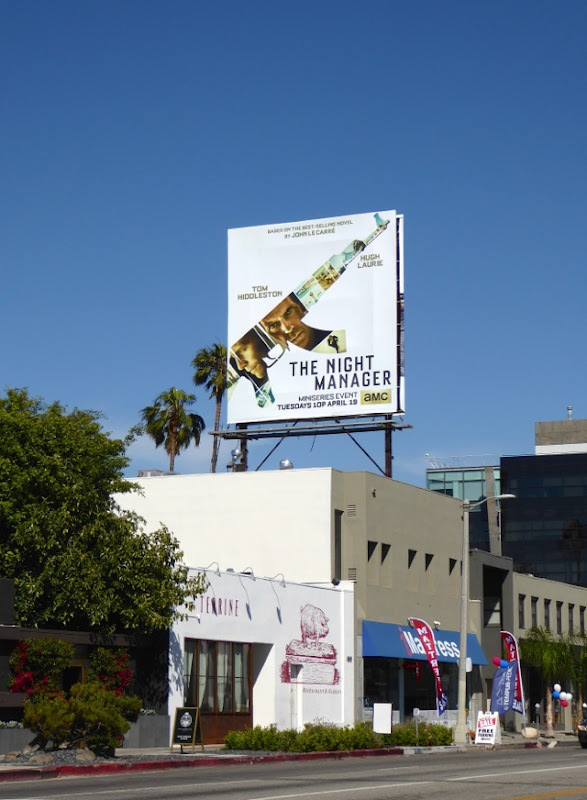 Here's a new awards consideration billboard photographed along West Hollywood's Sunset Strip on November 17, 2016.